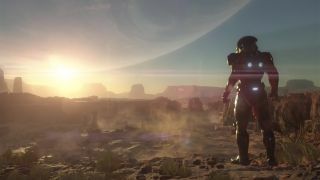 If you were expecting Mass Effect Andromeda to land in 2016, you may have to add another year to your cryo-sleep chamber, because EA’s chief financial officer Blake Jorgensen has revealed that the game will now be released next year. Speaking at Morgan Stanley’s Technology, Media & Telecom Conference, and picked up by a NeoGAF user, Jorgensen let slip that Andromeda would release in EA’s fiscal fourth quarter, which actually takes place between January and March 2017. Along with Andromeda, Jorgensen also gave release date details for its next Battlefield game, Titanfall 2 and Mirror’s Edge Catalyst. “We’ve got our Battlefield first-person shooter game coming in the third quarter, and our third-party title that Respawn, our partner, built, it’s called Titanfall, it’s the second title that they brought into that brand,” said Jorgensen, before moving on to Mirror’s Edge and Mass Effect Andromeda. “We have our Mirror’s Edge runner game this first quarter, and then we have Mass Effect, which is a sci-fi action game, in our fourth quarter,” said the CFO. Mass Effect Andromeda was expected to have a holiday 2016 release date, as announced at E3 last year.